Customers on software maintenance can download and install v11.0.3 of Predator MDC for Android from our ftp site at any time. Customers running v10 or older of Predator MDC for Android should contact us at sales@predator-software.com for upgrade details and pricing. Customers on software maintenance can download and install v10.0.28 of Predator MDC for Android from our ftp site at any time. Customers running v9 or older of Predator MDC for Android should contact us at sales@predator-software.com for upgrade details and pricing. Predator MDC for Android v10.0.26 has been released. 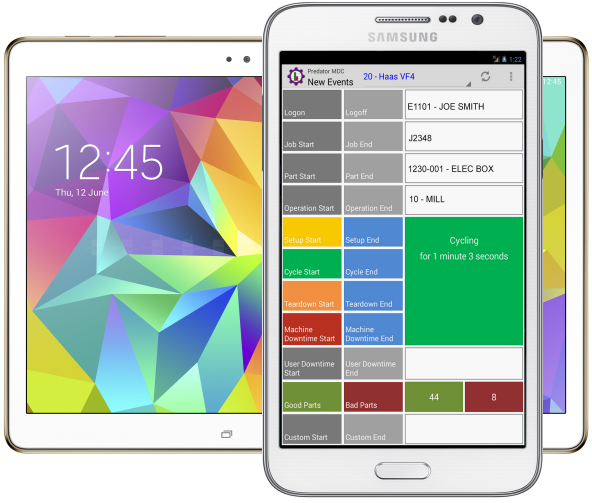 This new Android application is a real-time manufacturing data collection application for operators and machinists that runs on modern Android tablets and smart phones. Predator MDC for Android simplifies real-time manual data collection from machine operators and machinists with an all new touch only interface. Supports cycle time, idle time, setup time, teardown time, machine downtime and more. Predator MDC for Android improves manufacturing by supplying accurate people based events to improve operations and to make better decisions. Customers on software maintenance can download and install v10.0.26 of Predator MDC for Android from our ftp site at any time. Customers running v9 or older of Predator MDC for Android should contact us at sales@predator-software.com for upgrade details and pricing. Are tablets and phones supported with Predator MDC for Android? Yes. Both types of devices are supported. What screen resolutions does Predator MDC for Android support? All screen resolutions are supported. Predator MDC for Android automatically resizes all screen elements to fit the screen resolution.